Virtual Works is committed to ensuring that your partnership brings you full value, through our vendors you can leverage on the sales available to you to maximize this value. Register today. 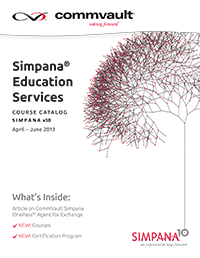 The CommVault® "Ask the Educator" Webinar Series-find attached "The EMEA Course Catalogue at the end of the article." We hope you have attended the two “live” “Ask the Educator” webinars that were presented in January and February. If you did not attend, you can view them on demand. They received excellent reviews. Three new webinars have been added to our schedule and are listed below. If you are not familiar with the series, the "Ask the Educator" webinars focus on CommVault-centric valuable technology topics. Each topic in this monthly series is presented by a highly experienced CommVault Educator; knowledge specialists with years of CommVault "know-how" and thousands of hours of teaching experience. The presenting Educator begins the webinar with a practical technical summary of the featured Simpana® software functionality followed by a review of tips, techniques, and Best Practices to help expand your CommVault knowledge and expertise. Throughout the discussion and a "live" question and answer session, you and your peers will share valuable experiences and best methods for managing and protecting data. Register Today. Attend one, some or all Sessions. We hope to see you at the "live" webinar each month. Your active participation will help to ensure that "Ask the Educators" is a highly successful "learning" webinar series. Sessions are also recorded and can be viewed by registered attendees that cannot "make" the live session.